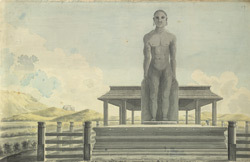 Water-colour drawing by John Johnson of the monolithic statute of the Jain Tirthankara Gomateshvara at Karkala in Karnataka. This drawing is taken from a sketch-book of 36 drawings (36 folios) depicting scenes chiefly in W. India and Mysore, dated c.1795-1801. A few inscriptions in pencil and ink remain (some relating to Colonel Johnson); others have been trimmed. The religious centre of Karkala, situated 15 km north of Mudabidri, is famous for the 45 feet tall monolithic statue of the Jain Tirthankara Gomateshvara situated on the top of a granite rock. The statue was erected by a Jain king in 1432 in memory of Bhubali, the first Tirthankara who renounced the world and become an ascetic. Opposite the statue there is a Jain temple of granite known as 'Chaturmukha basadi' and a carved pillar or Manastambha almost 50 feet high. There are five statues of Gomateshwara in Karnataka, the most famous of which stands at Shravana Belgola where it was installed in 981 A.D.